"With the skill of a seasoned teacher and the care of a dear friend, Elizabeth Esther lights the path forward for those escaping unhealthy religious environments and habits. Rarely is a single book this personal and practical, compelling and profound. With Spiritual Sobriety, Esther establishes herself as one of our culture's most important healers. Her words of hope and healing will undoubtedly impact generations." "No matter your religious addictions, theological positions, or how you plan to vote in the next election, the compassionate kindness of God cannot be moved. With an unexpected blend of tender vulnerability and cutting honesty, Elizabeth Esther emerges from a spiritually abusive past as a woman who takes that truth to heart, learning to be kind to herself in the process. Her willingness to stay small in the presence of God is perhaps what I admire most about her." "If, like Matthew's Gospel said, you're worn out and burned out on religion, this practical and tender book will help you come away with Jesus and recover your real life. Elizabeth Esther is an honest, kind, frank, and real companion for your journey to spiritual sobriety." 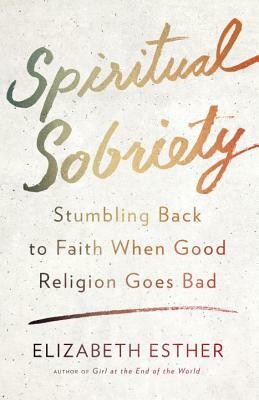 " Spiritual Sobriety is extraordinarily helpful, generous, and woven with the thread of true freedom. After reading, you'll learn that a lasting faith should be steady and grounded, rather than a frenzy of purely emotional highs and lows. I'm so grateful for this book and highly recommend it to anyone looking for lasting spiritual health."